upon the supposition that our standard is absolutely correct. But the length of the standard decimeter itself has to be determined by means of microscopic measurements, and since the temperature plays a considerable role, it is difficult to avoid errors very much larger than those due to the microscope. If we combine all these errors, we can probably attain at best an accuracy in all measurements involved of the order of one part in 100,000. Finally, we have to measure the angle ACB, and it is very much more difficult to measure angles than lengths. 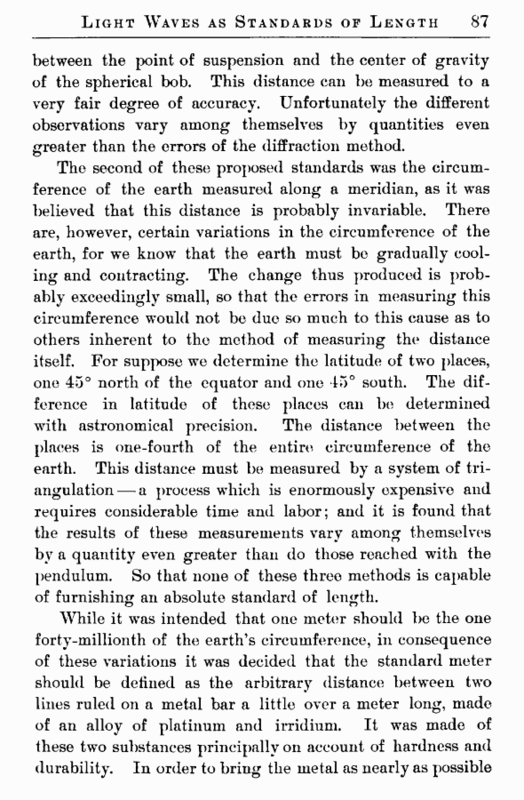 All these errors—the measurement of the angle, the error in the determination of the distance AC, that in the comparison of the intermediate standard which we use, and that in the distribution of these spaces—may combine in such a way that the total error may amount to very much more than one part in 100,000; it may be one in 20,000 or 30,000. This degree of accuracy, however, is greater than that attained by either of the other two methods wThich have been proposed for establishing an absolute standard of length. 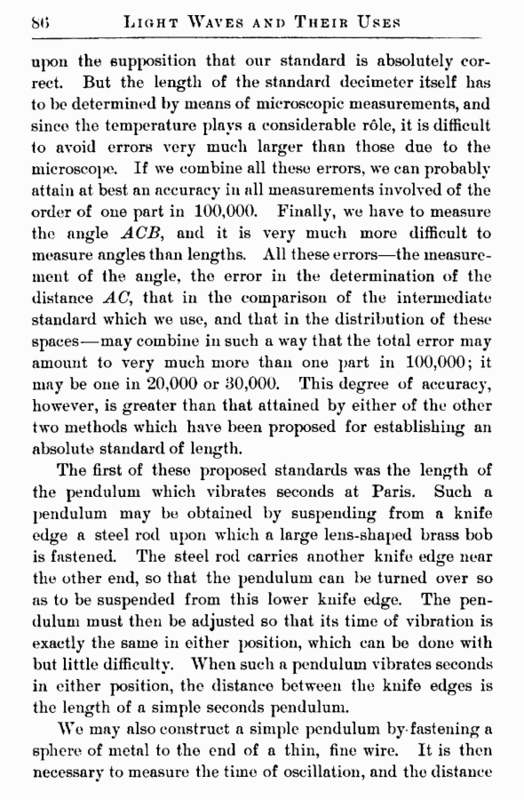 The first of these proposed standards was the length of the pendulum which vibrates seconds at Paris. Such a pendulum may be obtained by suspending from a knife edge a steel rod upon which a large lens-shaped brass bob is fastened. The steel rod carries another knife edge near the other end, so that the pendulum can be turned over so as to be suspended from this low^er knife edge. The pendulum must then be adjusted so that its time of vibration is exactly the same in either position, which can bo done with but little difficulty. When such a pendulum vibrates seconds in either position, the distance between the knife edges is the length of a simple seconds pendulum.